Wisconsin Harley-Davidson is your trusted source for the largest selection of Harley-Davidson® products. We are an authorized and licensed Harley-Davidson® dealer located in Oconomowoc, Wisconsin just west of Milwaukee. Explore the largest selection of official Harley-Davidson® products in Men's, Women's, Kid's, Collectables, Home Furnishings and Decor, Travel, Clothing, Footwear, and more. For customer service inquiries or to initiate a return, please contact Wisconsin Harley-Davidson at help@wisconsinharley.com or (262) 257-9700. 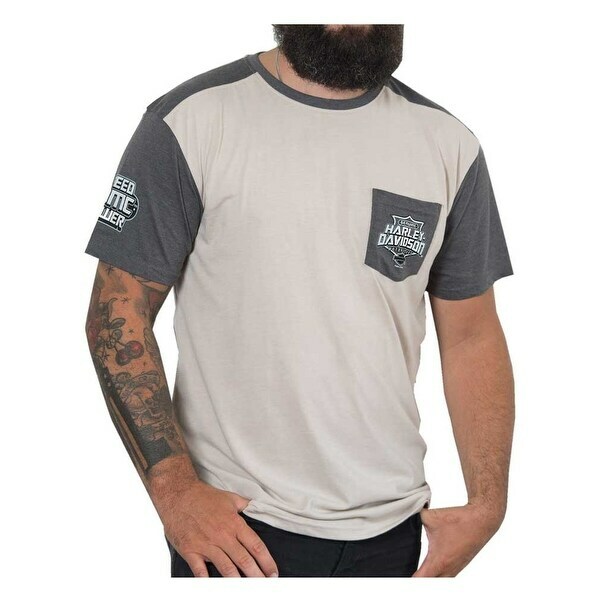 Harley-Davidson® Men's Medals Premium Short Sleeve Raglan Pocket Tee, 30298591. Decked out with an awesome custom Harley-Davidson® script graphic screen printed on chest pocket. Bonus HDMC graphic screen printed on sleeve. This design uses soft-hand ink to create a unique "must have" look and feel. Back features our Wisconsin Harley-Davidson Dealer logo. Classic style, traditional comfort fit. Crew-neck in an attractive ivory and vintage gray style. Extremely soft high-quality tee, made from a polyester blend. This t-shirt has it all; comfort, quality and of course style! 30298591.